BBC Radio 4's You and Yours on 24 April 2009 featured an item on the Olympics in Greenwich Park. This clip starts with a young mum explaining that she visits the Park three times a week with one or all of her three children. As she has no garden, and there being no alternative within walking distance, she is worried about the effect that closures of the Park would have on her family. She subsequently wrote to NOGOE and, with her permission, her letter is reproduced here because it highlights another point that has been overlooked by the organisers of the Games. "I always notice something new when I go to the Park and yesterday, a glorious day I enjoyed with my three year old, was no exception. First, I noticed a school group taking their PE lesson near the tennis courts and then at least four or five people using this beautiful space as a place of quiet contemplation and, it appeared, remembrance. When you look closely you can see that most of the avenues and footpaths are lined with seats of remembrance. Where are the people who use these seats as a means of coming to terms with, and indulging, their loss to go during the Park’s closure? Plus, of course, the Park’s open spaces and beautiful walks, as well as the Pavilion Tea House, are often used by those working with the disabled and mentally handicapped. I just thought I’d pass on these thoughts so that you can flag them with the powers that be. I don’t know whether more reasons for not closing the Park are needed but you never know". There are thousands like this young mother. The therapeutic value of the "countryside within the city" that is Greenwich Park is too inconvenient for LOCOG to think about. We know that in this great green space the bereaved find solace, and people convalescing after surgery can take gentle exercise. 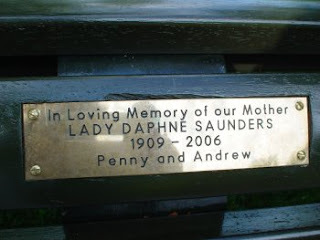 There are dedicated benches and many young saplings planted in memory of loved ones. Although an assurance has been given that no trees would be cut down, there is no guarantee that these young saplings might not be moved if they are in the way. The organisers do not understand how much local people love Greenwich Park, as it is, and have no idea of the unique role it plays in the local community. To close the Park, merely to showcase an elitist sport, is an insane idea.